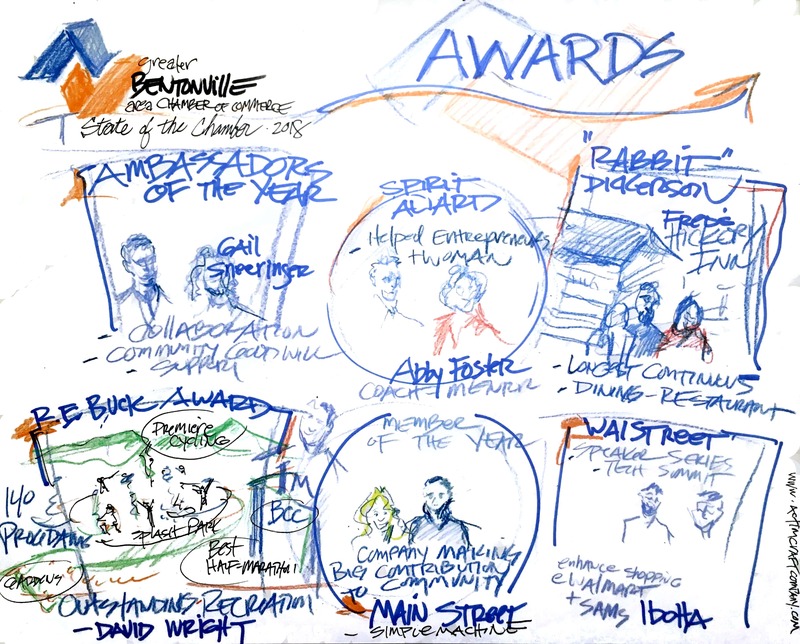 Scroll down for videos, summaries, and graphic recordings from the lunch, or download the PDF. Craig Rivaldo, the Chamber Chairman of the Chamber Board, explained that many in the community got together to strategize the future of the Chamber. They changed the name and logo and focused on how the Chamber could be more relevant and effective to the business community. They conducted a nationwide search for a new CEO who could understand the area, be innovative and have vision. They found and hired Graham Cobb and named him CEO and President. Strategic Question: What do the leaders in the community expect from the Chamber going forward? Graham Cobb, the new President and CEO of the Greater Bentonville Area Chamber of Commerce rode in on his mountain bike. Graham pledged that the Chamber would be future-focused and evolve quickly. The Chamber is evaluating all of its programs so each one meets relevant needs and is effective. In addition to serving the community, the Chamber will be intentional and unwavering about reaching out to every business person in the diverse community including young people. The goal is to empower the businesses of today and ensure a great environment for the creative workforce of the future. Graham cited how in his first few days he found that people were working on high profile projects like feature films and an entry to Sundance, but they were also welcoming and thoughtful to him and his family. Graham and his wife marveled at the friendliness and cosmopolitan cuisine and asked, “What is this place? Where are we?” Graham said, “Because Bentonville,” now that hashtag #BecauseBentonville has been used by hundreds from craft beer lovers, foodies to cyclists. 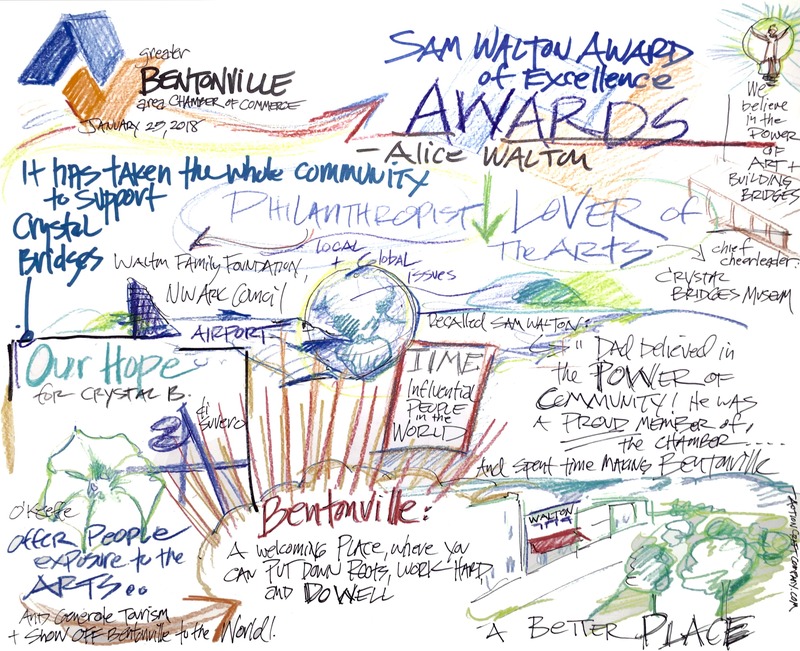 #BecauseBentonville is about how Bentonville is metropolitan and yet down home in its feel. Graham said that if he holds to the old chamber model, it will fail. 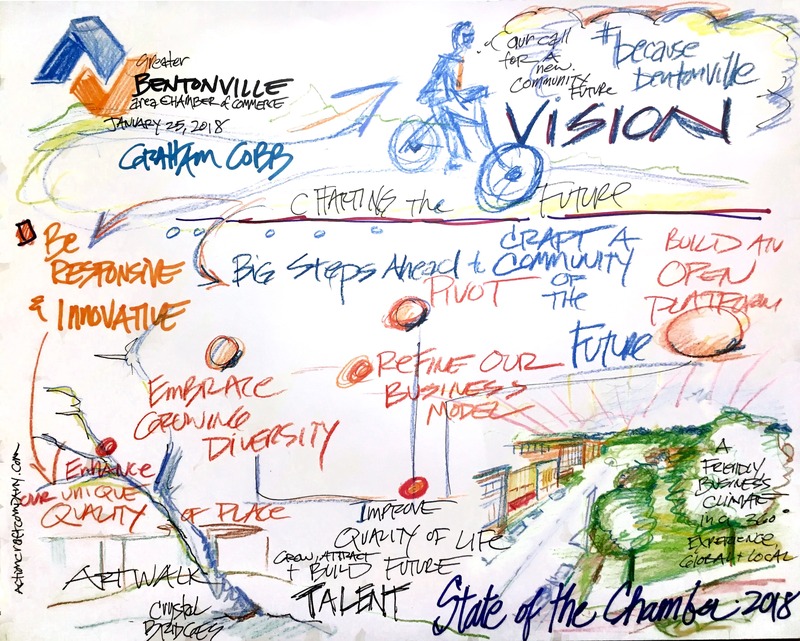 There is an old chamber saying that “If you’ve seen one chamber, you’ve seen one chamber.” The Bentonville community is like no other one in the world. Over 50% of us have moved here from somewhere else. We are local and global. He said the GBACC will honor the history of this area and work with educators to attract and grow a world class work force. The Chamber will focus on the quality of place for arts, outdoors, food and respect the partnerships that are part of the DNA. The Chamber will provide innovative content and programming that benefits all the people here whether a company is a start-up that opened last year or a start-up that began 30 years ago. Strategic Questions: What is the new CEO’s vision for the Greater Bentonville Area Chamber of Commerce in 2018 and what key actions should members take to help realize that vision? The Bentonville Chamber has over 60 Ambassadors. 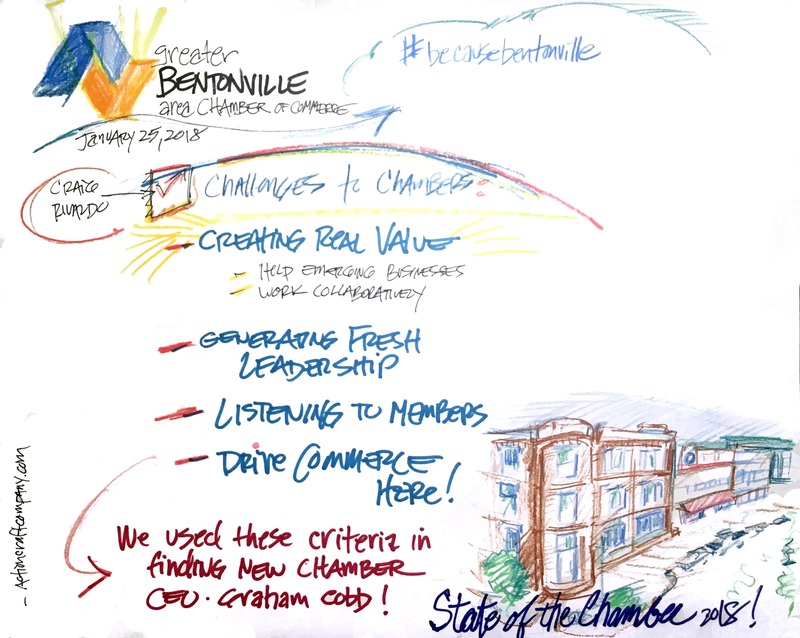 What does it mean to be an Ambassador for the Bentonville Chamber? These volunteers welcome new members and connect with them to support them. Gail Sneeringer of Arvest rarely misses a ribbon cutting, ground breaking, event, check in, meetings or opportunity to talk to some about the Chamber. She exemplifies the spirit and intent of the Chamber of Commerce, which is one of collaboration, community goodwill, and support. Every year it is exciting to select the Spirit award winner because it provides the opportunity to say “thank you” to an individual or organization that has contributed so much to the Chamber. Abby Foster has been a great asset to the Chamber’s success in 2017 helping with check in at many events and helping young entrepreneurs and women develop their businesses and careers in ways that honor their unique and diverse offerings. The Rabbit Dickerson award is presented in recognition of special contribution made to the community and it requires a minimum of 20 years of residency or doing business in the Bentonville area. In late 1969, Fred and Lou Gaye acquired two acres of hilltop land on Route 4, Highway 71, After more than 40 years of renovations as the longest fine dining restaurant in Benton County the local dining tradition, the current owners continue with the unparalleled spirit of hospitality established by founders Fred & Lou Gaye. Many of facilities and events we have come to love, such as the 140 recreation programs, Easter at Orchards Park, Bentonville Half Marathon and Training Program, Slaughter Pen Jam, the Razorback Greenway, our Downtown Public Gardens, Bentonville Community Center, the Bentonville Bark Park, public art installations, and a downtown splash park came into existence under David Wright’s leadership. Today, Bentonville Parks and Recreation is commonly known as one of the top departments in this part of the country and many of the facilities and events have won awards. In November 2017, the BCC welcomed the 1,000,000th customer since opening in June 2015. An estimated 2,000,000 people visited one of Bentonville’s parks or trails. The Chamber MainStreet Award recognizes the significant contributions to the Chamber and the community through outstanding leadership and extraordinary support. MainStreet membership constitutes small businesses, nonprofit organizations, industry, non-supplier businesses and individuals. Within the past three years, Simplemachine has grown from a 4 figure revenue/year husband and wife team business, to a company projecting to hit 7 figures in 2018 and nine employees. The company was started by Sean Morrison when he was 25, with only a few hundred dollars, and every penny that was made was put right back into the business. The Chamber WalStreet Award recognizes the significant contributions to the Chamber and the community through outstanding leadership and extraordinary support. WalStreet membership consists of frontline suppliers to Walmart and Sam’s Club and third party providers. Our WalStreet Member of the Year has been supportive of our WalStreet Speaker series and our newly added WalStreet Fireside Chats. They have also been actively involved with the Northwest Arkansas Technology Summit. Ibotta is the 3rd largest mobile shopping app in the US and the starting point for earning cash back on your omni-channel shopping. Strategic Questions: How do Chamber members move the organization and community forward through their volunteer efforts? How can each of us do better? Alice Walton is a philanthropist and lover of the arts. Her contribution to the Walton Family Foundation and Crystal Bridges has won her global and national recognition. She was named by Time Magazine as one of the most influential people in the world. She is a founding member of the Northwest Arkansas Council which opened the airport and helped develop important infrastructure in the area. Strategic Questions: What were the goals and driving forces behind Crystal Bridges? How did the community support the effort? How can the Chamber and its members help fulfill and extend Crystal Bridges’ mission? 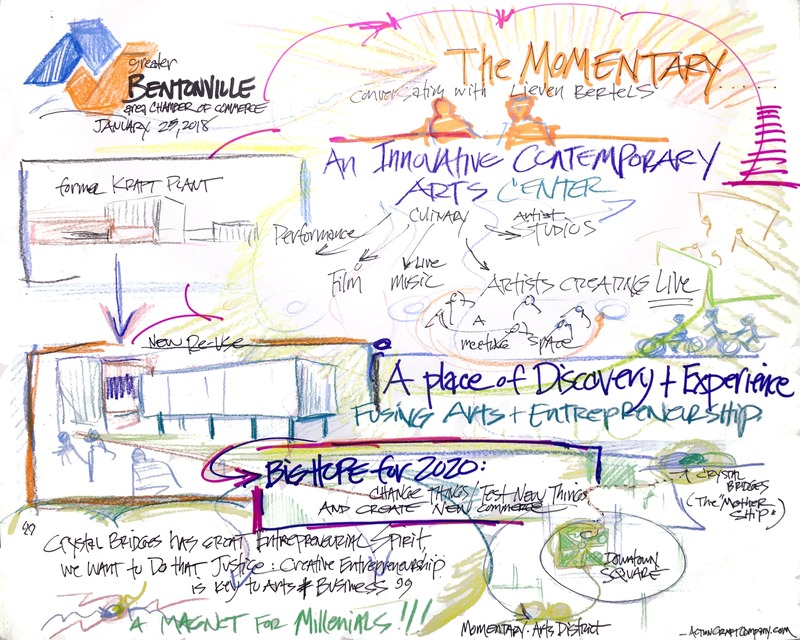 Lieven, from Belgium, finds Bentonville a welcoming place where art is being created. The Momentary will have culinary offerings, live music and artist studios so people can see how art is being made these days. It’s also a meeting place. Lieven remarked that it’s special that the Chamber is allowing this conversation about creativity, arts and culture to happen during the luncheon. Strategic Questions: How does support of the arts also support innovation and entrepreneurship in the area?